Toaster Music, an improvisational electronic music duo and curatorial team, has created an ambitious art exhibition for October’s First Fridays Long Beach art walk in Bixby Knolls. Nightmare Self-Portraits, opening on Friday, October 2nd, will fill the North and South galleries of the Expo Arts Center, showcasing the work of some of the best artists in Southern California. In the North Gallery, some of Long Beach’s arts luminaries will be featured, including Jeff McMillan, who was the only local artist commissioned by the recent city-wide Pow! Wow! mural event. He also co-curated the Long Beach Museum of Art’s wildly successful Masterworks exhibition, and will soon be traveling to Australia to exhibit 65 works from his Prigus Sport series. New works by Gary Musgrave, Vince Mattina, Sheriann Ki Sun Burnham, Clinton Neuhaus, Dave Van Patten, Liz Steinworth, Daniel Barajas, Chris Wheeler, and Jan Edward Vogels will also be featured. The South Gallery, curated by Connie Ericson, will include work by Brandon Singleton, Heather Proctor, Ericson, and others. Proctor has created a detailed illustration, using colored pencils, of herself as a zombie with her face torn open. She’ll also have a collection of framed zombie caricatures, and will be creating zombie caricatures for a nominal fee. Singleton will be exhibiting a collection of monsters created in a pop surrealist style, rendered in a variety of media. Ericson will be showcasing large charcoal sketches, dark abstract drawings, and a subtle self-portrait with a faint ghostly form. 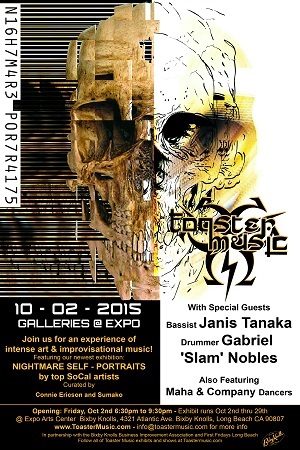 Toaster Music, for the first time, will be featuring two musical collaborators: Janis Tanaka and Gabriel ‘Slam’ Nobles. Tanaka, a Long Beach native, has a long and storied career as a bassist, recording and touring with artists including L7, Pink, Jackson Saints and, more recently, with Femme Fatale and Winterthrall. Nobles, a percussionist and educator, specializes in drum set, mallets, and timpani. He plays all genres of music, and has performed with Freddie Hubbard, Patti Labelle, Chaka Khan, Dionne Warwick, and the Long Beach Symphony. He performs regularly as part of MajicBulletTheory, and Orange Peal Vibrations. Also performing are members of Maha And Company, a local dance troupe led by Maha Afra, a highly rated professor of dance at Cerritos College. The Expo Arts Center is located in the Bixby Knolls neighborhood of Long Beach, at 4321 Atlantic Avenue. The exhibition and performances are presented in partnership with the Bixby Knolls Business Improvement Association. Art viewings outside of First Fridays are available by appointment. Contact Sumako at Sumako6@Gmail.com for details. To learn more about Toaster Music, visit ToasterMusic.com.